“Our total solution for SmartLabel offers trading partners an unprecedented ability to reach consumers directly as they make decisions: in store, online, in real time,” said Dan Wilkinson, Chief Commercial Officer, 1WorldSync. 1WorldSync, the leading multi-enterprise product information network, and Label Insight, the leading provider of SaaS data solutions providing powerful insights for strengthening the connections between CPG brands, retailers and consumers, announce they have partnered to provide the industry’s most complete solution to help brands meet consumer demand for transparency of food information through the SmartLabel™ initiative. 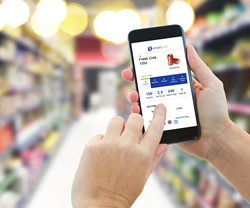 Led by the Grocery Manufacturers Association (GMA) and Food Marketing Institute (FMI), SmartLabel is a consumer transparency initiative committed to building trust with consumers by providing comprehensive product information in an easy, standardized and accessible digital format. The joint SmartLabel™ solution brings together Label Insight’s ability to enable data generation, transformation and enrichment with 1WorldSync’s powerful platform for executing complex data governance strategies and disseminating product information globally. Combining these assets, 1WorldSync and Label Insight deliver an unparalleled SmartLabel solution with the most powerful tools available for freely sharing detailed product information with today’s connected consumers. Label Insight offers a level of food data that is unmatched, analyzing 15,000 attributes -- such as nutrients and allergens -- per product. This deep level of attribution allows the company to automatically map required and voluntary SmartLabel attributes, helping organizations implement SmartLabel in a matter of days. 1WorldSync’s Product Information Cloud provides transparency and compliance solutions for all trading partners, with sustainable product-information-exchange mechanisms for global commerce and regulatory compliance initiatives like SmartLabel. The new SmartLabel solution is part of the company’s full suite of transparency and compliance product information solutions, offering customers the ability to capture, enrich, manage and distribute on a global basis, with local expertise and implementation. Label Insight is the leading provider of SaaS data solutions, providing powerful insights for and strengthening the connections between CPG brands, retailers and consumers. The company's cloud-based product data engine enables CPG brands and retailers to transform basic product data into smart attributes, providing a deep understanding of their product set. Label Insight offers an unmatched level of data, generating 15,000 attributes - such as nutrients and allergens - per product. These attributes serve as building blocks for a live view of data for more than 300,000 products across 17,000 brands, totaling over 80 percent of the U.S. retail food and beverage market. Label Insight customers use this deep level of product data to provide greater transparency to consumers; maximize category growth potential; easily participate in industry and government initiatives, such as SmartLabel; and create more connected omni-channel experiences. To learn more about Label Insight’s ability to streamline the product data process and improve transparency, visit http://www.LabelInsight.com.